Join us for a webinar on May 20, 2016, at 9 AM PDT. Join us along with presenters Chris Ahern (DotProduct LLC) and Alex Lorman (SeaMachines) to see the rapid capture capabilities of the DotProduct scanner and the import of compressed scan data into Rhino 5 for Windows using a real project from SeaMachines. DP data is imported into Rhino via the free plug-in for using point cloud data within the powerful Rhino modeling environment. The webinar is for Rhino and DotProduct users alike, to demonstrate the ease of capturing as-built 3D data with the DotProduct DPI-8 Kit, and the value of implementing it into the Rhino 3D design process. 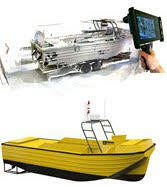 DotProduct develops high performance, easy-to-use solutions for capturing 3D data. Their technology is designed for mobile professionals who need quality spatial data, instantly. DotProduct software turns Android tablets into real-time 3D-capture and processing on the job site. Really cool! This sounds like a really interesting webinar. Is there anywhere I can view it archived? This will posted to News Blog soon. However, here is the link to wiki that the page where the video links have been posted, as well as all the contact information of the preenters.